The Quick View window that appears on the V3 themes is just like any other HTML page. It allows you to make edits and changes to it how you see fit. To get to it, you'll need to know a little bit about layouts. To get to the quick view, you will want to log into your admin panel. 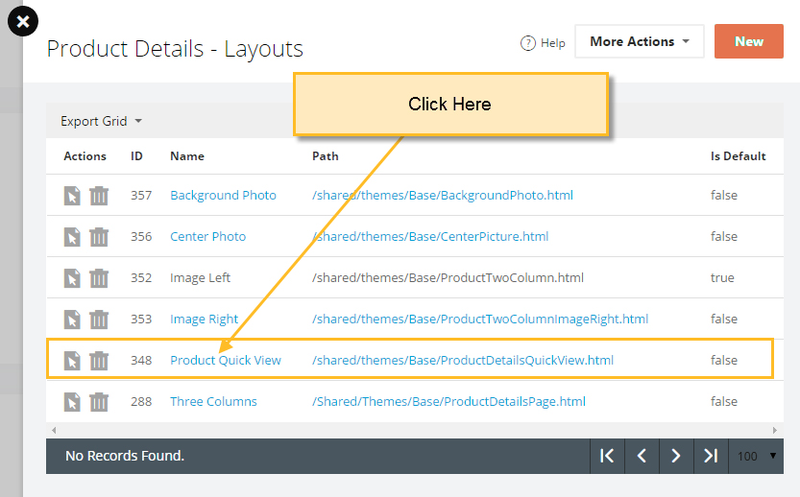 From here, go to Themes > Edit Theme > Product Details. Now that you're here, click on More Actions > Layouts, and a menu will come out of the right side of the page. Simply click the Product Quick View link, and the menu will close. After the menu closes, the admin panel will refresh back to the Basic Settings page. Near the top of the page, you'll see the text Product Details - Basic Settings. Underneath it in smaller text will now appear the words Product Quick View. The smaller text is the layout that you are currently editing. Now you can simply go to the HTML Editor to make the desired edits to the Quick View modal.